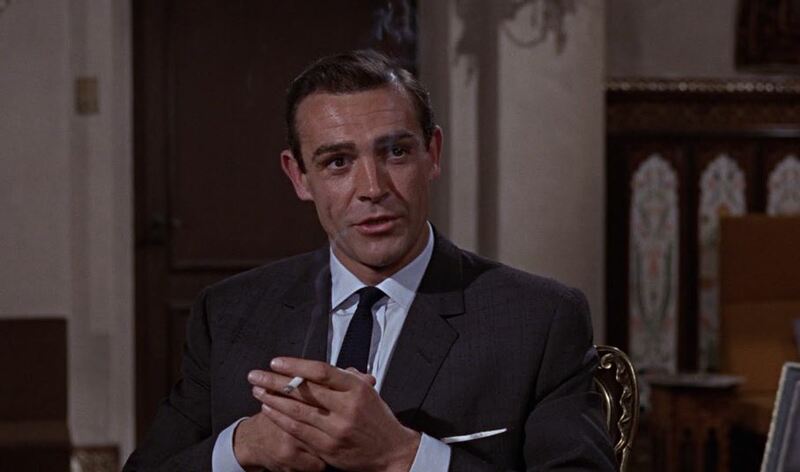 Rewatching the James Bond films chronologically. 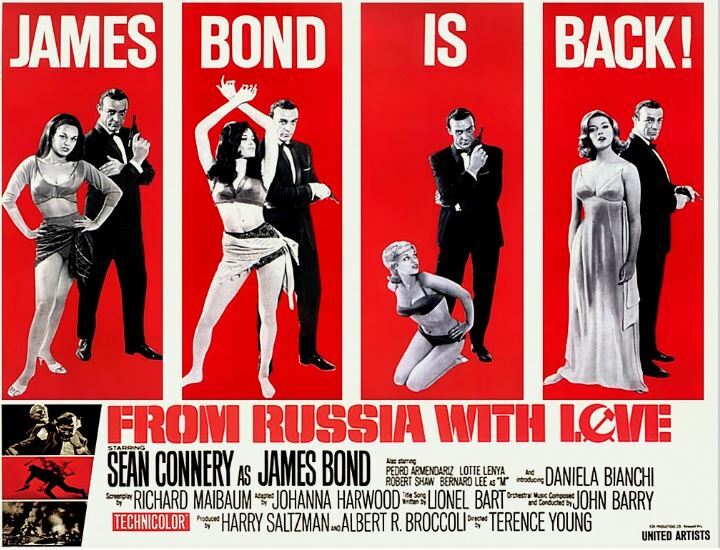 The Cold War makes its first appearance, along with a bunch of other Bond firsts, in the second film, From Russia With Love. Bond blurb: The evil organization S.P.E.C.T.R.E. is up to no good, with a plot to steal a high-tech cypher machine from a female Russian cryptographer, with their own agents working within both British and Russian intelligence. The villains didn’t expect Bond and the lovely Russian to fall for each other, though. Despite “Russia” in the title, most of the film takes place in Istanbul, complete with a side visit to a gypsy carnival. Bond background: Bond is still dating Sylvia Trench, who romanced him briefly in the previous movie. She’s somehow devolved from seductress to clingy girlfriend, which is probably why we never see her again. Bond is much more upbeat and cheery in this film than in the last one, perhaps to make him a more romantic figure rather than a cold and ruthless “license to kill” agent. Bond baddies: There are tons of villains in this one, all working for S.P.E.C.T.R.E. You’ve got the hulking blonde muscleman Red Grant, knife-shoed Russian sourpuss Rosa Klebb, and various other henchmen. The villain to care about, though, is introduced as “Number One,” seen only as a pair of hands stroking a white cat. You and I both know it’s Blofeld, but this won’t be revealed until future movies. Nice to know that Marvel didn’t invent this type of seed-laying. Bond best brains: Bond gets a new briefcase lined with hidden weapons, secret compartments, and a tear gas canister that explodes upon anyone opening it the wrong way. He also has a camera with a built in microphone recorder. (Hey, I bet my iPhone can do that, too.) Let’s not forget that this movie is the first appearance of the great Desmond Llewelyn as Q. 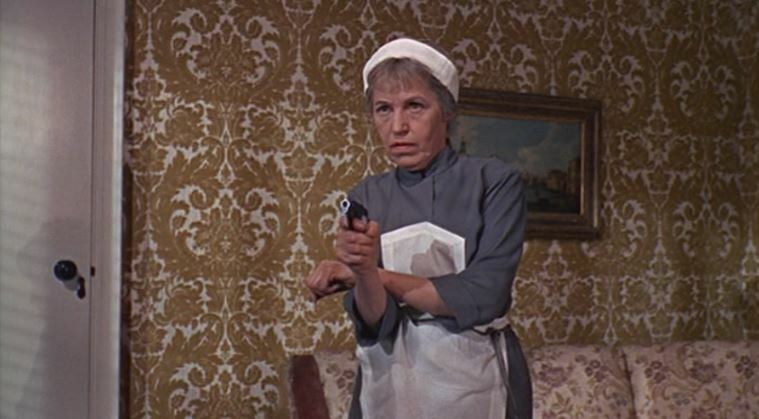 Bond bash-ups: Villains shoot up the gypsy camp, and there’s a neat bit where a baddie gets taken out with a sniper rifle. Stealing the cryptographer involves shooting up an office with tear gas and escaping through a rat-filled tunnel. 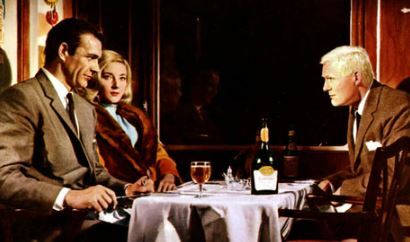 The latter part of the film takes place aboard a train, where there is, of course, sneakiness and double-crosses. It ends with a two-part finale with some truly impressive helicopter stunts followed by a boat chase with tons of great practical effects. Bond baggage: Dr. No was surprisingly non-political. 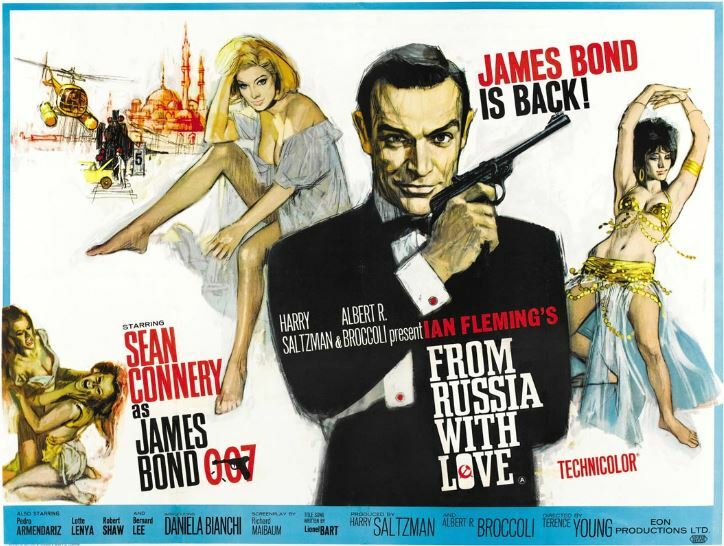 Bond was an “agent” and Dr. No was a “criminal.” In this film, though, the ever-present Cold War of 1960s makes its appearance, as tensions involving the Russians give the whole movie its drive. Bond babble: There’s an odd structure to the movie in that so much of it is setup. Bond doesn’t appear until 17 minutes in, and he doesn’t meet Tatiana to kick off the plot until 53 minutes in. The first hour is devoted to moving the pieces around the board, and it takes a lot of mental dot-connecting to keep track of who’s outfoxing who. Then we get all the stuff on the train. I’d always thought “the one where they spend the whole movie on the train” was the boring one, but on this rewatch, I really got into the watch-your-back suspense of it all. You could argue that the movie’s too long, but it still has a lot of great moments. Next: He’s the man, the man with the Midas touch.